Zona Diamond Needle Files provide aggressive, precise shaping for any hobby on glass, metal, ceramics, marble, wood, plastics, stone, bone, polymer clay etc. Each set has 5 files. 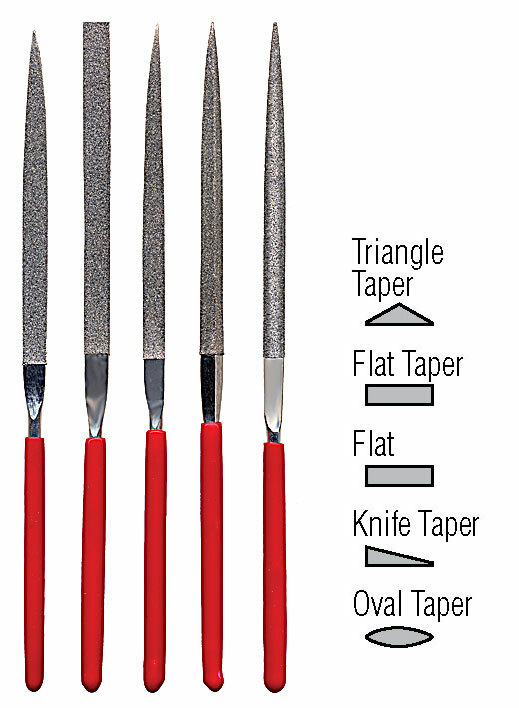 • Zona’s Flat Shape Diamond File Set 37-354 has these profiles: Triangle Taper, Flat Taper, Flat, Knife Taper, and Oval Taper in a sturdy reusable plastic case. 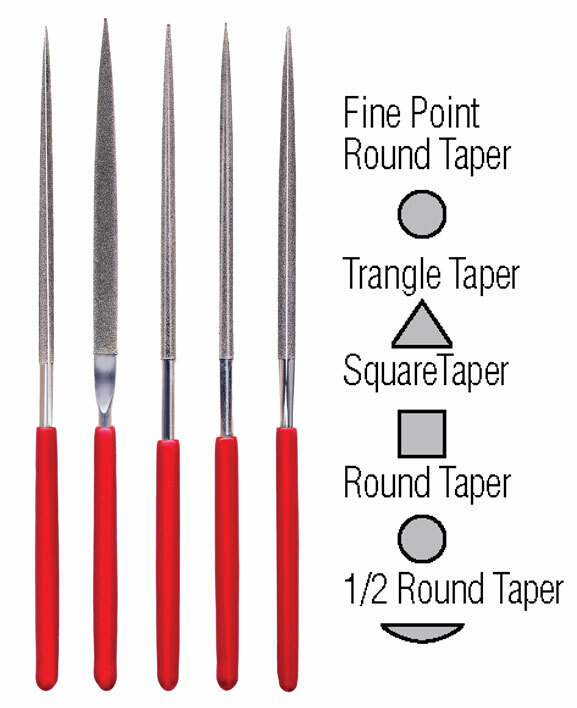 • Fine Point Diamond File Set 37-352 has smaller shapes: Round Taper, Triangle Taper, Square Taper, Larger Round Taper, and 1/2 Round Taper also in a sturdy reusable plastic case. Diamond Files are made by electroplating diamond on to steel blanks. They cut in all directions, on both push and pull stroke, and with sawing, twisting or circular motion which is an advantage over steel files which only cut in one direction. Not only do these files shape and finish, they can also enlarge holes in beads, file edges of ceramic or porcelain, work on inside edges of miniature or intricate projects, smooth the ends of wires or scratches and marks, puncture or engrave many materials, sharpen small tools and objects, bevel glass edges, shape mosaic tiles, and remove excess solder. Hobbyists, craftspeople, tinkerers and artisans including miniature makers, model builders, jewelry and polymer clay artists, luthiers and other musical instrument makers will find these very useful.